In the middle of Gothenburg, there is an urban amusement park by the name of Liseberg, which was derived from its original name Lisas Berg (click to find out more). At only 17 hectares large - understandable due to its location in the dead-centre of the city - the park boasts a surprisingly good amount of attractions that are undoubtedly world class and even some of the world's best. It also helps that the park utilizes the natural terrain and surroundings to add even more excitement to their attraction offerings. Visited by around 3.1 million guests every year, Liseberg currently stands as the 7th most visited park in Europe and 2nd most visited park in the Scandinavian region (after Tivoli Garden's ~4.7 million figure). 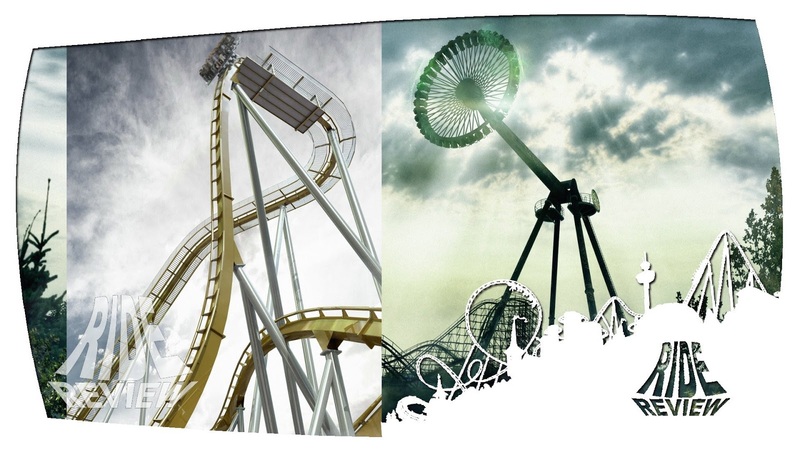 Despite its small size, Liseberg provides plenty of hair-raising attractions. The first thing that I'd like to suggest is to go buy your tickets online, which is priced at SEK 455 per guest - roughly USD 50 or GBP 39.50. While the price of online ticket is exactly the same as that of in-park ticket, the online purchase gives you extra perks: Express Pass to 3 participating attractions of your choice. That's right! By buying your tickets online, you get complimentary Express Passes for 3 attractions of your choice, which I think is an excellent value. One downside to obtaining Express Pass through your online ticket purchase is that you have to decide in advance which attractions you are planning to use your Express Passes for. I recommended you got Express Passes for Balder and Helix for sure because there are the top attractions at the park. During my purchase, I used my 3rd Express Pass for Kanonen. Unfortunately, the roller coaster was closed for good on December 30th, 2016 for future projects. As such, I recommend you to use it on Lisebergbanan or Atmosfear, depending on your taste. On a crowded day like this, you'll find Express Pass to be a huge blessing. Should the park be crowded, it's nice to plan your day ahead in order to experience your attractions of choice. I recommend you hitting either Helix and Balder first thing in the morning, followed by other top attractions in the park like AtmostFear, Lisebergbanan, and AeroSpin. It's also a good idea to arrive at the park within 60 minutes of the park's opening hours (check here). If you're visiting during the peak summer season (June - August), make sure you do exactly that as the park will be crowded, especially during weekends. Liseberg provides plenty of space for its guests to wander around. As soon as you enter Liseberg, the one thing that you will notice straight away is how forested and well-planted the amusement park is. True to my initial expectation, Liseberg keeps the natural plants in its place even until today. A significant portion of the - the right side to the main entrance - generally consists of natural terrain with visibly mature trees and thick layers of vegetation. A well-planted hill immediately after the main entrance provides an excellent view of Helix and a nice shade from the sun. On the day of my visit, the weather was excellent. The sun was shining and the day was generally warm, which - I found out later - is apparently a rarity in Gothenburg. Good thing is my park was really enjoyable. I didn't have to worry about wearing a jacket nor wearing a rain coat or even worrying about attractions being closed due to weather conditions. The bad thing, however, was that there were so many people. Like SO. MANY. PEOPLE. It seems everyone looked out of the window in the morning and synchronously had the same thought, "It's a good day today. Let's go to Liseberg!" First thing that I noticed right away was actually before I even entered the park: inefficient entrance staffing. Because I purchased my ticket online, I had to enter the park through the "online ticket" lane, which was - oh my... - manned by one single person. This created a bottleneck effect with many people trying to enter the park having to wait extra 10-15 minutes just to get their printed tickets scanned and be let through. I found this rather inefficient and annoying. The park is divided into two sections by the midway that goes from the main entrance to the second entrance: the flatland (to the left of the main entrance) - which is larger than the hill - and the hill (to the right side). As you can see in the park map, the flatland side of the park is much easier to navigate. The hill poses some challenges to navigate. Despite the presence of accessible paths, there are quite steep even for normal guests, so be prepared for lots of climbing if you visit the park. The park is undoubtedly Scandinavian as seen through the theming, which carries distinctive homage to the images of Scandinavian heritage. At one section of the park, where the river flows from one end to another, guests can sit down outside red-walled houses as they sip their drinks and watch people pass by. It's great to know that despite how crowded and small the park is, Liseberg still provides places for those who want to take more relaxed approaches to their visit. The riverside area provides nice shade for guests to relax. In terms of ride operations themselves, I found them to be average at best: not excellent, but not horrible either. Helix and Balder understandably had queue time of 60+ minutes due to the massive crowd that day. Dispatch time for both coasters, for example, were around 45 seconds for Helix and 60 seconds for Balder, which were quite normal for me (especially Balder because it has double safety in place: the seat belt and the restraints). Overall, I enjoyed my visit to Liseberg, which was unfortunate because I wanted to stay longer but was unable to because I had to catch a train. One day, I will definitely come back to have a more relaxed day at the park. It's another day of sun at Liseberg. The queue for Balder sneaked outside the entire queue line. If there's one thing to say about Balder, this is the one roller coaster in the park that, in my opinion, rings true to the phrase "don't judge a book by its cover." At only 118 feet tall and just a little bit over 3,500 feet long, Balder doesn't sound like a huge roller coaster at all. 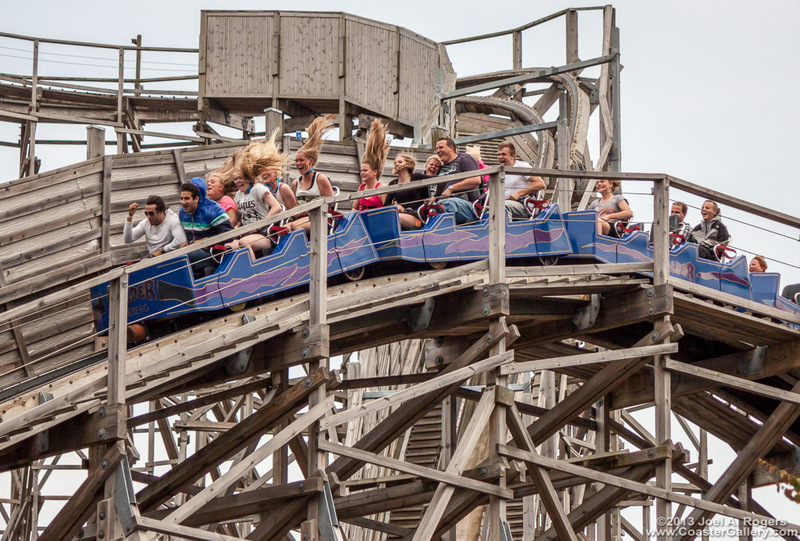 Compared to, say, Colossos, a similar type of wooden coaster that opened two years prior, Balder sounds insignificant. But what it lacks in stats, it makes up for the ride experience itself. Balder is a favorite of many visitors thanks to its airtime, which goes on throughout the entire course of the coaster. Riders are taken from one airtime hill to another relentlessly, leaving them with no space to breathe inbetween. But this is why the roller coaster can be described as intense by so many: because it leaves them no time to breathe. Before you even recover from the shock of that massive airtime, here comes another one. Each time a train goes over the airtime hills, it makes a loud roar to signify that the bottom wheels of the train touches the train hard. That's how intense the airtime is. But that's not all. Balder has 9 airtime hills and we're talking about huge airtime here. Notice the hairs of the women flying as they go through an airtime hill. Notice again how the hair went straight up as they went through a smaller, less intense airtime hill. Less of a highlight but great regardless is Balder's first drop, which measures at approximately 70 degrees in terms of angle of descent. It's at this moment that unsuspecting riders usually begin to realize how much of an intense coaster Balder truly is. Those who sit at the back will get an unsuspecting airtime as they're literally dragged down before they even start going downhill. Adding to the enjoyment is the fact that Balder is extremely smooth for a wooden roller coaster thanks to Intamin's new model using prefabricated track. While the structure is wooden, Intamin prepared the raw materials using computerized method, making the structure to be completed more accurately. Additionally, this allows the construction to be faster, as instead of constructing from scratch, the coaster can be constructed in a plug-and-play way like Lego pieces. Currently, there are 4 roller coasters around the world that uses the same design as Balder: 3 currently operating and 1 not. Balder's first drop and one of the coaster's many airtime hills. Balder is a roller coaster that catapulted Liseberg's status as a world-class theme park and brings unforgettable experience to the many people who have ridden it. It is undoubtedly one of Europe's best roller coasters - if not Europe's best wooden roller coaster - that will keep guests coming to Liseberg for the many years to come. 10/10. Just when I thought I found my favorite roller coaster at Liseberg, the park proved me wrong. Walking to the top of the hill on the other side of the park is Helix, the park's newest, multi-launch roller coaster that is the biggest investment the park has ever done in its 90-year history ($30 million). Helix's final airtime hill gave one of the best airtime I have ever experienced. Helix is manufactured by Mack Rides, who in the years prior to the opening of Helix designed the now world-renowned Blue Fire at their showcase theme park, Europa Park. Helix seems to be the second generation of the wildly successful Mack Rides' launch coaster model. Unlike its predecessor, Helix has two launches and is simply bigger: longer and taller too. Fortunately, the roller coaster maintains the comfortable restraints that the manufacturer used in its prototype coaster. Helix's ride begins at the very top of the hill by the main entrance, which can be reached by an escalator ride - or stairs, but I don't recommend it. The ride begins with a drop leading to a corkscrew immediately after the station. This is what makes Helix so unique and so unlike any other coasters on the planet: the experience begins immediately after the train leaves the station. No room to breathe, once the train goes out, there goes Helix. Helix's Norwegian Loop is one of the main highlights of the experience. I love Helix not only because it's smooth, comfortable, and fast. Just like Blue Fire, each element seems to be carefully placed. The transition flows so perfectly and beautifully, it feels like the coaster is choreographed not by engineers but by dancers. The launches, while not forceful, are made much more intense (compared to that of Blue Fire) by leading directly to upwards inversions that give you nice hangtime while you're upside down. The train then swifts and swerves beautifully and smoothly around, up and down, the hills, hugging the natural terrain with gentle swoops. The Norwegian Loop is the most forceful part of the coaster yet still maintains its grace with the surrounding environment. Helix is a true highlight because of its ability to create thrill and excitement in such challenging landscape. Liseberg did an excellent job in blending the roller coaster experience with the surrounding nature. Helix's inversion following the second launch is the highest point of the roller coaster. Helix is an investment that is truly worth it; a roller coaster that had a humble, down-to-earth opening in 2014 and became a massive hit amongst coaster enthusiasts around the world... and it's no wonder why. As a coaster that has one of the best pacing out there, this is a roller coaster lover's dream: it's forceful, it's smooth, and it's unique. Because of that, Helix is a true winner for me. 10/10. By the time this blog post was published, Kanonen had already been closed for good. But not to worry. There will be something great and bigger to replace this cute roller coaster... we'll get to that in a bit. Kanonen was an Intamin launched coaster that was actually amongst one of the world's smallest of its kind. Measured at only 1,443.6 feet long and peaked at 78.8 feet tall, Kanonen accelerated riders from 0 to 46.6 mph in 2 seconds - which was extremely tame, really, compared to the acceleration of Top Thrill Dragster and Kingda Ka. Kanonen's top hat measures at 78.8 feet tall, one of the world's smallest of its kind. For its size, though, Kanonen packed quite a bit of a punch. It had two inversions: a vertical loop and a heartline roll through the loop. The coaster took riders through tight turns and some bumpy hills to create more force throughout the course. Unfortunately, this didn't work effectively, though. At only 50 seconds long, the ride proved to be too short to even start enjoying the ride. But again, we can't blame Liseberg for this rather tiny ride. After all, they had extremely limited space to build an attraction and they ended up with this very compact Intamin launched coaster. Kanonen had a very compact layout. Notice how small the vertical loop was. Having said that, Kanonen's departure is in my opinion the right thing for Liseberg to do. Other than the fact that the coaster was too small anyways, the capacity of the coaster leaned more towards the lower side, making the queue time to be normally longer than normal. Kanonen will be missed, but certainly something better will replace its spot, and I'm sure it will be worth it. 6/10. From its look, AtmosFear is nothing more than just another drop tower. It takes you up, hold you at the top for a while, and then down you go at a free fall speed. Sounds simple, yes, but AtmosFear is a unique experience. AtmosFear shares the same escalator ride as Helix. AtmosFear is actually Europe's tallest drop ride and one of the world's tallest. At 381 feet tall, this Intamin creation drops the guests for 300 feet, reaching a top speed of 68 mph - making it the fastest ride in the park - before being slowed down by the magnetic brakes at the bottom of the tower. The fun starts as the ride takes you up slowly while the gondola rotates, giving you ample amount of time to enjoy the view of Gothenburg and Liseberg. At the top of the tower, the gondola rotates for a couple more seconds before it stops and then the countdown begins in Swedish. Before you know it, your gondola drops and the ride is over. Riders look up before they're being sent up the 381-foot tower. AtmosFear is both relaxing and intense. The ride undoubtedly provides guests with the best view of the city from the park... but only guests who dare to drop in the 300-foot plunge, of course. This is one of the best drop rides I've ever been on. The rotating ascent, the couple of seconds of enjoyment at the top, and the countdown all make up for a relatively ordinary ride experience. 8/10. As one of the older roller coasters at the park, Lisebergbanan is a jewel of the park. At 147.7 feet tall and 4,397 feet long, the ride can seem intimidating if people only look at the stats. Surprisingly, the ride has a top speed of only 49.7 mph, making it a family-friendly attraction. Lisebergbanan was designed as a "stroll ride" roller coaster in which guests are taken from the bottom to the top of the hill of Liseberg. Following the ascent, riders are sent through the many turns and swoops as they go down the hills little by little, picking up speed on each turn. Lisebergbanan's station is at the bottom of the hill. Lisebergbanan gives a wonderful view of the park, as seen from the photo above. Lisebergbanan is, admittedly, too relaxed for my taste. Without any forceful nor steep drops, it feels more like a scenic train ride that happens to have fast sections to scream for here and there. Nevertheless, I thoroughly enjoy Lisebergbanan more as a journey rather than a roller coaster. The scenic route the coaster takes - meandering around the hill, up and down, circling around - is very exciting, especially because the train is extremely close to the surrounding plants at some points. Lisebergbanan might not be the most intense roller coaster at the park. Yet, it has everything a family attraction can ask for: the children will be thrilled by the drops and the fast sections, while the adults can simply sit back and enjoy the view of the park from the hill. Moreover, because this is a Schwarzkopf coaster - a defunct roller coaster manufacturing company - it also creates that unique roaring sound that you can hear throughout the park. 8/10. Almost the entirety of Lisebergbanan's course is in the wooded area of the park, making it difficult for people to take photos of the roller coaster. The park also boasts numerous attractions that are worth seeing if you haven't been on them before. AeroSpin, opened in 2016, is a spin-around ride in which riders board plane-shaped gondolas that take them up into the air. Riders are given the full control of the wing flaps, allowing them to invert their gondolas to their likings. Definitely not for the faint of heart. Be careful to not go upside down too much or you risk vomiting at the crowd below! 8/10. Mostly, though, Liseberg is simply a charming amusement park to sit back and watch the things that happen naturally around you. Crowd enjoying a sunny day at Liseberg. With the closure of Kanonen, Liseberg has finally announced that they will be redeveloping the area into a themed area of its own, covering three attractions: the existing Balder and the two new attractions opening in 2017 and 2018 respectively, Loke and Valkyria. The themed area will have the three attractions joint in a plot line themed to Norse Mythology. Whereas Balder is the son of the Gods Frigg and Odin, Valkyria is a winged creature that brings a fallen warrior from the Middle Earth to the afterlife. So how do you think Valkyria will bring Balder to the afterlife? With a pendulum named Loke. Liseberg's newest additions will bring a Norse Mythology come to life in 2017 and 2018. For an urban amusement park, Liseberg is definitely a must visit for roller coaster enthusiasts and those who are seeking a unique, different theme park experience. Distinctively Scandinavian and charming in its own way, Liseberg might as well be a highlight of your visit to Sweden. While many tend to flock to Stockholm, the capital of the country, Gothenburg itself is a city with its own charm that is only 3 hours away from Stockholm by train. So the next time you're visiting Sweden, don't just stay in Stockholm. Take a detour to Gothenburg, enjoy the city, and dare your friends to go on what I call two of the world's best roller coasters: Balder and Helix.